It has been 18 months. And I kind of can´t believe that. It has been 18 months of high intensity growth and learning and serving. It has been 18 months of many tears and a lot more laughs and moments of great joy. Many changes, many people, and much love. It seems as though the time passed quickly, but when I remember back to the beginning of my mission, it seems like another lifetime. I can see now, how the Lord has changed me along the way. I have come to love Him. I thought I believed in the gospel and that I knew lots of things about God, but I only really started to know Him when I began to serve Him. He humbled me and showed me how much I really have to learn. I have seen His miracles and His love all around me. I have witnessed Him change the lives of the people around me. His light has filled me. I love representing Him. It has been my honor and privilege to wear the name of His Son every day. I love my Savior, His gospel, and His Church. He has prepared the truth here for us so that we may have complete joy and know the way back home. I am grateful for the question of a young boy in 1820 that spurred the Restoration of the Church of Jesus Christ. His complete and full truth is here again upon the Earth. His authority to preach and teach and heal and baptize is here upon the Earth. The Book of Mormon is His true word that compliments the Bible, expands our knowledge, and guides us to the truth. I asked of God (James 1:5) and He answered me. It is the key. It shows us His way. Monday and Tuesday I caught a weird 24 hour flu with the works. But by Wednesday morning I was all good and normal again. So glad that passed. This week we have been working closely with a really awesome family! Emanoele who´s 12 and her mom, Vania. I love these ladies. They went to church with us last week and loved it. Emanoele is preparing to be baptized in two more weeks. We want to help her mom too, but she lives with her husband and he said he doesn´t want to get married... so we have to wait on that one for now. Karla! Karla is our neighbor and is so happy! We love Karla. She went to church with us yesterday and said she felt so happy and welcomed. It was awesome. And we had a surprise guest waiting at our sacrament meeting – Mission President Bonini! He was the last speaker and he killed it. I love that man. Karla is preparing to be baptized next weekend! Preface: This week I started getting a bunch of crap from all the sisters and the members about how I´m getting close to getting home, how they´ll all be waiting to get my wedding invitations in a few weeks and blah blah blah. This morning I woke up and came to my desk and there was an old plastic water bottle with a post-it on it - "your prince"
So now i have a little frog friend (we´re going to let him go later today) named Feijão (like the pet frog beans from cheaper by the dozen). 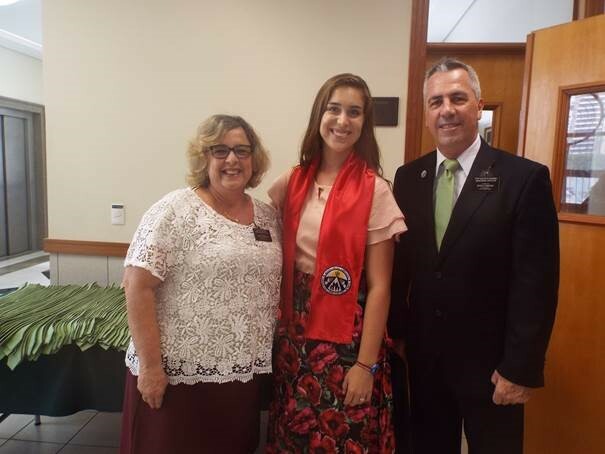 I love Conjunto Ceará and Sister RIbeiro and the Book of Mormon and being a missionary! This week is going to be awesome. The smell of baptisms are in the air. I met a little girl who´s 3 years old who looks exactly like me when i was little. It was crazy! I showed her the picture i have of me and dad when i was 4ish. me: "wow! when did you meet my dad?!" Ruby: "he came over and i met him!" me: "my dad came here?? did you hug him?" Even she was convinced by the photographic evidence. I´m very impressed by the strength of this ward and the power of their recent converts. All of the recent converts have callings. It´s so great! GUYS IT IS CHRISTMAS. WOW. okay. pause. everyone stop what you´re doing and go watch this video. Anyways, two divisions made the week fly by. We spent Tuesday in Itapipoca and Friday in Aguanambi. 5 For behold, the time cometh, and is not far distant, that with power, the Lord Omnipotent who reigneth, who was, and is from all eternity to alleternity, shall come down from heaven among the children of men, and shalldwell in a tabernacle of clay, and shall go forth amongst men, working mightymiracles, such as healing the sick, raising the dead, causing the lame to walk,the blind to receive their sight, and the deaf to hear, and curing all manner ofdiseases. 6 And he shall cast out devils, or the evil spirits which dwell in the hearts ofthe children of men. 7 And lo, he shall suffer temptations, and pain of body, hunger, thirst, andfatigue, even more than man can suffer, except it be unto death; for behold,blood cometh from every pore, so great shall be his anguish for the wickednessand the abominations of his people. 8 And he shall be called Jesus Christ, the Son of God, the Father of heaven andearth, the Creator of all things from the beginning; and his mother shall becalled Mary. 9 And lo, he cometh unto his own, that salvation might come unto thechildren of men even through faith on his name; and even after all this theyshall consider him a man, and say that he hath a devil, and shall scourge him,and shall crucify him. 10 And he shall rise the third day from the dead; and behold, he standeth tojudge the world; and behold, all these things are done that a righteousjudgment might come upon the children of men. Here´s another video because CHRISTMAS! ...so here is the equivalent of like, 13,000 words! Couldn't write this week, so I hope the photo essay makes up for it! I am now a professional bucket showerer and certified bug hunter because it was I who had to get all of the lice and larva out of her hair. God is good because I came out of it all without being contaminated #blessed. Tuesday morning I got a surprise phone call at 6:45 am. It was from the assistants. I had a mini heart attack because I thought I was getting emergency transferred. But it turns out they´re just great people who keep promises. It was Sister Meira calling me from the airport before going home! I cried! haha! Spending 24/7 with someone for 6 months makes for big love. Rereading The Book of Mormon and falling a little bit more in love every time. George Cannon said: "No wicked man could write such a book as this; and no good man would write it, unless it were true and he were commanded of God to do so." I love The Book of Mormon because it feels true. We don´t need an angel to appear or the ground to shake to know what is true. We can pray for truth and seek for truth and read for truth and feel it in our hearts. Truth is simple and it just feels right. USA HAS A NEW PRES. I WENT 7 DAYS WITHOUT A COXINHA. Roberto is on track to be baptized this Saturday (yessssssssss)! We saw lots of blessings of obedience and diligence this week. I read a funny article in the Liahona this week about patience. The author compared it to grilled cheese, which i found amusing. Anyways, here´s the link. I´ve learned a lot about patience in these last couple transfers. We were seeing few results and it was really hard for me to not lose faith in our efforts. We had a few good investigators, but nobody that could give immediate fruits. I liked the question that the writer asks - Do you want it now or do you want it right? I´ve had to wait for true, interested, converted investigators. I wanted to be able to help everyone believe and accept in 2 weeks, but every person receives his testimony at a different time. The Lord has a perfect timetable and He lets things happen perfectly. Patience helped me learn more gratitude and trust in all things that the Lord does. This is the greatest work I have ever been a part of. This week killed (in a good way). We´re pumped. Jamyli and Daniel have an officially official wedding and baptismal date (YAS), we found a brother-and-sister duo that are awesome and came to church with us on Sunday! And our investigator, who I will be nicknaming Marty because his name is crazy, is starving for more and more truth! We love teaching him. These next few weeks are gonna be "top". Last monday we went to the town hall place (still can´t remember what the heck this word is in english) to mark Jamyli´s wedding. When we got there, we were super sad because she didn´t have an updated birth certificate so she couldn´t mark without the new one (probably the equivalent to a marriage license). We left there in poor spirits because Jamyli is from the suuuuper interior of Ceará, and we knew it would take a while to get the updated document. The next day, Jamyli started tracking down the town hall in her little town and turns out that some guy who works there was planning to come to Fortaleza on Thursday and promised to bring the birth certificate! Literally two days later, this guy showed up with a perfect, beautiful, new, updated birth certificate for Jamyli!! Friday she went back to the town hall center place and scheduled her wedding for October 28th! We went on splits this week and after we visited one of the sisters´ investigators, he asked if he could give us a Buddhist thank you. We were like "uhhhhh......". Before we could think or reply, he was down on all fours and kissed both of our feet. So that was interesting. One of my favorite General Conference moments was from Elder Gary E. Sevenson´s talk. He said "as we look to the Book, we look to the Lord". The Book of Mormon is the iron rod and it leads us as long as we let it. I have come to love it so much. As we seek to understand and be strengthened by it´s pages, we learn of God´s love and feel His protection in every moment.